Welcome to Hillbilly Deluxe in Pigeon Forge! 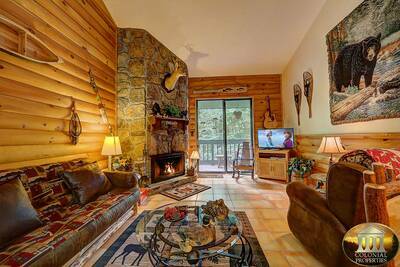 This beautiful 2 bedroom, 2 bath Smoky Mountain cabin rental is truly an amazing place to spend your next vacation getaway. With its wonderful location, you and your guests will have quick, easy access to all of the attractions, shopping, dining and entertainment options of the Smokies. As soon as you arrive at Hillbilly Deluxe, you are greeted by the impressive natural wood and mountain stone accented exterior. The luxurious living room features plush leather furnishings, a cozy stone accented fireplace, a 32” HDTV and access to the main level covered deck. Just off of the living area is the fully equipped kitchen with upgraded appliances and all of the necessary utensils to enjoy a fantastic meal while staying in Pigeon Forge. There’s also a nearby dining table that seats up to 6 people comfortably. Take a walk upstairs and you’ll enter the absolutely fabulous king suite. This luxury bedroom features a restful pillow top mattress, bedside jetted soaking tub, 32” flat screen TV, gleaming wood cathedral ceiling overhead, in-suite full bath, sofa and access to its own private deck with rocking chairs. Venture down to the lower level of Hillbilly Deluxe and you’ll enter the fun-filled game room. Challenge your guests to a game of pool, turn on the stereo to enjoy your favorite tunes or grab a seat and watch TV on the flat screen. Adjoining the game room is the second king suite bedroom. After a day of exploring the Smoky Mountains, Pigeon Forge and Gatlinburg, you can return here for a wonderful nights sleep. 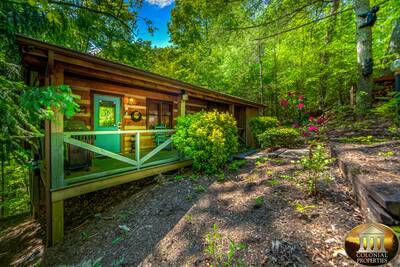 You’ll have access to the attached full bath with spa fixtures and your own private deck with rocking chairs. 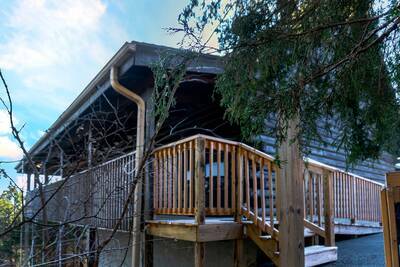 Walk out onto the rear covered deck for a truly remarkable experience. Here you’ll find the bubbling outdoor hot tub overlooking the forest, the BBQ grill and a patio table that’s perfect for a picnic lunch. Be sure to pack along your laptop, tablet or smart device to enjoy the complimentary high speed internet access while staying at this Pigeon Forge cabin rental. Hillbilly Deluxe offers you and your guests a splendid location to explore all of sights in the Smokies plus luxurious features and amenities that will make you feel right at home. From the 4 levels of decking, 2 relaxing master suites, steamy hot tub and entertaining game room, you’ll love every minute of your vacation while staying here. Reserve your Smoky Mountain vacation adventure today! A: This resort does not have swimming pool access. A: Hi Karen, there is a property location map located at the bottom of the cabin page that should assist you! It is not far at all from Tanger! A: Yes! At this time it does have a pool table. A: Hi Melinda! Hillbilly Deluxe is located in the resort Cabins at the Crossing. This is located approximately 20 minutes from Wears Valley. A: Hi Jazzmin! Hillbilly Deluxe is located approximately 10-15 minutes to the Island. A: This cabin has 2 King Beds,1 Futon,1 Full Sleeper. A: Hi Aaron! You must be at least 25 years old to reserve this cabin. A: Hi Erin! Yes, there is one sofa sleeper, as well as a futon too, in addition to the king beds. “ Our stay at the hillbilly deluxe was great. Comfortable beds, more than enough room, & all the amenities we could ever need. We enjoyed our stay. The decor was cute too!! “ My family and I had a wonderful time! The cabin was beautifully decorated and very clean. We were very pleased with the service we received from Colonial Rentals and we will for sure be renting from them in the future. “ The location was in a quiet area close to shopping and restaurants. Cabin layout was good and the decor was just as shown online. Cabin was clean and all necessary items were well stocked (towels, pots & pans, dishes, etc). “ We spent a week here on a baseball tourament. We loved the area and the cabin. We could have had another week at this cabin. Very quiet and very close all the area attractions. “ The cabin was wonderful. It was exactly as seen in the online pics. It was very clean and private. We had a wonderful time. 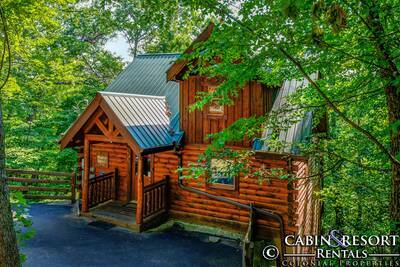 “ This was my first time staying in Pigeon Forge and the cabin definitely made us feel comfortable. We were able to grill and soak in the hot tub and got great sleep! There was no noise from surrounding cabins, we were truly able to relax when we came back from a day out on the town. The location was perfect! We will definitely be coming back! “ My family and I enjoyed the beautiful cabin, the views and the location. Overall, we loved the getaway. “ We brought our family to the Smokies for a few day and thoroughly enjoyed our stay at the Hillbilly Deluxe. Beautiful, spacious, conveniently located ... we will definitely be back! Thanks for everything! “ This was a great rental cabin. I love the openness of it, and it was very up to date and clean. “ We had a wonderful time. The cabin was great and close enough to everything that it only took a few minutes to get there! We will definitely visit again! “ Very quiet area - Loved the floor plan giving privacy for each guest - there is so much to do - we have vacationed in the area 6+ times and never want to leave - wished we could have stayed longer just to stay a full relaxing day in the cabin. “ Loved our time in the Hillbilly Deluxe cabin. Felt right at home. Very clean and comfortable. Would recommend this cabin and highly recommend Colonial Properties as your next cabin rental company. My family and I will definitely be using Colonial Properties again for our next vacation. “ We had a wonderful time in the Smoky Mountains. Hillbilly Deluxe is very nice, and the location great we were close to everything. But the next time we will need one with less stairs, because there are lot. Overall experience AWESOME & we will be back. “ It was a pleasant experience from start to finish. Everyone was very friendly and helpful. It was everything the advertisement said it would be. We had a great time and would love to stay again soon. “ I absolutely loved this cabin! Everything about it! It was very clean and included everything you need to cook a full meal. It was a very relaxing and peaceful stay. 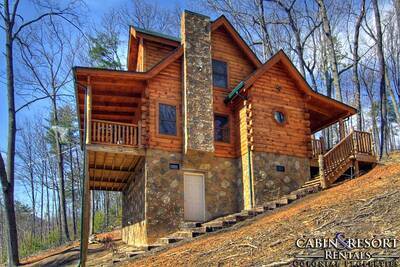 My family and I will definitely be returning to this exact cabin!! “ This cabin is located out of town enough to be peaceful and quiet but close enough to be very convenient to all the pigeon forge attractions. It is maintained beautifully. Very picturesque and clean. “ The cabin was very clean, affordable and has lots of privacy. It is fully equipped for all your needs and conveniently located to everything. All of the appliances are new and in great condition. I would rent this cabin again because my children loved it as well!